California English mostly aligns to typical American speech, most Californians specifically speaking with a Western American accent. The following vowel diagram represents the relative positions of the stressed pure vowels of the accent, based on nine speakers from southern California in the 1990s. Notable is the absence of /ɔ/ (the vowel sound of caught, stalk, clawed, etc. ), which has completely merged with /ɑ/ (the vowel sound of cot, stock, clod, etc. ), as in most of the Western United States, as well as the relatively open quality of /ɪ/ due to the California vowel shift discussed below. Front vowels are raised before /ŋ/, so that the traditional "short a" /æ/ and "short i" /ɪ/ sounds are raised to the "long a" [e] and "long ee" [i] sounds, respectively, when before the ng sound /ŋ/. [ citation needed] This change makes for minimal pairs such as king and keen, both having the same vowel [i], though this pronunciation is not spread evenly and the more common American pronunciation [kɪŋ] still exists in many areas of California. In other contexts, /ɪ/ (as in bit, rich, quick, etc.) has a fairly open pronunciation, as indicated in the vowel chart here. Similarly, a word like rang will often have the same vowel as rain in California English, rather than the same vowel as ran. Before /n/ or /m/ (as in ran or ram), /æ/ is raised and diphthongized to [eə] or [ɪə] (a widespread shift throughout most American English). Elsewhere, /æ/ is slightly lowered in the direction of [a] (something like the open a sound in Spanish or Italian), as a result of the California vowel shift (see below). The rise of uptalk  in Southern Californian English. One topic that has begun to receive much attention from scholars in recent decades has been the emergence of a vowel-based chain shift in California. This image on the right illustrates the California vowel shift. The vowel space of the image is a cross-section (as if looking at the interior of a mouth from a side profile perspective); it is a rough approximation of the space in a human mouth where the tongue is located in articulating certain vowel sounds (the left is the front of the mouth closer to the teeth, the right side of the chart being the back of the mouth). As with other vowel shifts, several vowels may be seen moving in a chain shift around the mouth. As one vowel encroaches upon the space of another, the adjacent vowel in turn experiences a movement in order to maximize phonemic differentiation. For convenience, California English will be compared with a "typical" General American English, abbreviated "GA". /ɛ/ is pulled towards [æ] (wreck and kettle are sounding more like rack and cattle), [æ] is pulled towards [ɑ], and /ɑ/ towards [ɒ] (cot and stock are sounding more like caught and stalk). California, like other Southwestern states, has borrowed many words from Spanish, especially for place names, food, and other cultural items, reflecting the heritage of the Californios. High concentrations of various ethnic groups throughout the state have contributed to general familiarity with words describing (especially cultural) phenomena. For example, a high concentration of Asian Americans from various cultural backgrounds, especially in urban and suburban metropolitan areas in California, has led to the adoption of the word hapa (itself originally a Hawaiian borrowing of English "half" ) to mean someone of mixed European/Islander or Asian/Islander heritage. ^ Podesva, Robert J., Annette D'Onofrio, Janneke Van Hofwegen, and Seung Kyung Kim (2015). "Country ideology and the California Vowel Shift." Language Variation and Change 48: 28-45. Cambridge University Press. ^ a b " California English." Do You Speak American? PBS. Macneil/Lehrer Productions. 2005. ^ a b Gordon, Matthew J. (2004). "The West and Midwest: phonology." Kortmann, Bernd, Kate Burridge, Rajend Mesthrie, Edgar W. Schneider and Clive Upton (eds). A Handbook of Varieties of English. Volume 1: Phonology, Volume 2: Morphology and Syntax. Berlin / New York: Mouton de Gruyter. p. 347. ^ Ward (2003:41): "fronted features in the young speakers seems to indicate a nascent chain shift in progress, [but] the lack of a true generational age range in the study precludes too strong of a conclusion. Alternatively Hinton et al. also suggest that possibility that the age-specific pattern could also be a function of age-grading, where the faddish speech style of California adolescents is adopted for its prestige value, only to be abandoned as adolescence wanes." ^ "SAGE Journals: Your gateway to world-class journal research". SAGE Journals. doi: 10.1177/0075424207307780. Retrieved 2019-03-14. ^ Upton Sinclair, Oil! (1927). ^ Bailey, Brianna (2015). "[newsok.com/article/5420122 Read this, y'all: Is the Okie dialect disappearing?]" NewsOK. ^ "Do you speak American? - California English". PBS. Retrieved October 28, 2013. ^ Ladefoged, Peter (1999). "American English". In Handbook of the International Phonetic Association, 41–44, Cambridge: Cambridge University Press. ISBN 0-521-63751-1. ^ "The Voices of California Project". web.stanford.edu. Retrieved 2019-03-14. ^ Eckert, Penelope (date unknown). Diagram. Retrieved from http://www.stanford.edu/~eckert/vowels.html. ^ "Professor Penelope Eckert's webpage". Stanford.edu. Retrieved 2011-12-30. ^ "Jorge Hankamer WebFest". Ling.ucsc.edu. Retrieved 2011-12-30. ^ "Lyrics | Skull Stomp - Hella". SongMeanings. 2008-11-02. Retrieved 2011-12-30. ^ "Choosing a Lane". California Driver Handbook (PDF). California Department of Motor Vehicles. 2010. p. 33. ^ Rose, Joseph (April 16, 2012). "Saturday Night Live's 'The Californians': Traffic's one big soap opera (video)". The Oregonian. Portland, Oregon. Retrieved December 3, 2013. ^ Simon, Mark (2000-06-30). "'The' Madness Must Stop Right Now". San Francisco Chronicle. Retrieved 2012-11-19. ^ Simon, Mark (2000-07-04). "Local Lingo Keeps 'The' Off Road". San Francisco Chronicle. Retrieved 2012-11-19. ^ Simon, Mark (July 29, 2000). "S.F. Wants Power, Not The Noise / Brown rejects docking floating plant off city". San Francisco Chronicle. Retrieved June 13, 2017. ^ a b Geyer, Grant (Summer 2001). 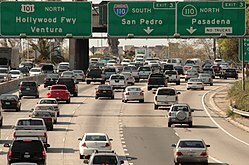 "'The' Freeway in Southern California". American Speech. 76 (2): 221–224. doi: 10.1215/00031283-76-2-221. ^ a b Ornelas, Cris (2012). " Kern County Accent Studied." 23 ABC News. E. W. Scripps Company. ^ Geenberg, Katherine (2014). " The Other California: Marginalization and Sociolinguistic Variation in Trinity County". Doctoral Dissertation, Stanford University. p. iv. ^ King, Ed (2012). " Stanford linguists seek to identify the elusive California accent". Stanford Report. Stanford University. ^ Geenberg, Katherine (2014). " The Other California: Marginalization and Sociolinguistic Variation in Trinity County". Doctoral Dissertation, Stanford University. pp. 4, 14. ^ Geenberg, Katherine (2014). " The Other California: Marginalization and Sociolinguistic Variation in Trinity County". Doctoral Dissertation, Stanford University. pp. 182-3. ^ Geenberg, Katherine (2014). " The Other California: Marginalization and Sociolinguistic Variation in Trinity County". Doctoral Dissertation, Stanford University. p. 200. ^ Take Two (2013). " Map: Do Californians have an accent? Listen to some examples and add your own." Southern California Public Radio. ^ Guerrero Jr, Armando (2014). "'You Speak Good English for Being Mexican' East Los Angeles Chicano/a English: Language & Identity". Voices. 2 (1): 56–7. ^ Guerrero Jr, Armando (2014). "'You Speak Good English for Being Mexican' East Los Angeles Chicano/a English: Language & Identity". Voices. 2 (1): 4. ^ Rawles, Myrtle R. (1966); "'Boontling': Esoteric Language of Boonville, California." In Western Folklore, Vol. 25, No. 2, pp. 93–103. California Folklore Society [Western States Folklore Society]. PBS.org: "Do you speak American? − California English"
USC.edu: "A hella new specifier" — by Rachelle Waksler, discussing usage of "hella". Binghamton.edu: "Word Up: Social Meanings of Slang in California Youth Culture" — by Mary Bucholtz Ph.D., UC Santa Barbara Department of Linguistics, includes discussion of "hella".